The teaching of karate incorporates the art of empty hand fighting, using arms, legs, elbows and feet to deliver devastating blows to your oponent. It further assist in developing fitness, self-discipline, confidence, mental awareness, respect and responsibility. Karate teaches you to syncronize mind and body in coordinated fast controlled movements. Upon developing the ability to coordinate mind and body, even the smallest person finds that he or she has within himself or herself the power to deliver a devastating blow to any would-be attacker. As the student approaches black belt level, technique, stamina, speed, and coordination become natural as a result of hours of hard practice. 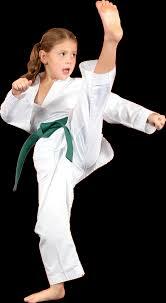 The practice of karate tones the body, develops coordination, quickens reflexes, and builds stamina, develops composure, a clearer thought process, deeper insight into one's mental capabilities, and more self-confidence. Gichin Funakoshi is known today as the father of modern day karate. He was born in 1868 in Okinawa. As a boy he studied karate under two masters, Master Itosu and Master Azato. When Funakoshi grew up he became a school teacher, training in karate all the while with both masters. Funakoshi, knowing the huge benefits of the study of karate, introduced karate into the Okinawan public school system. In 1922, the Japanese Ministry of Education held a martial arts demonstration in Tokyo and Funakoshi was asked to introduce Okinawan karate to Japan. His demonstration made a powerful impression on the Japanese public; Funakoshi was soon besieged with requests to further demonstrate and teach his art. Eventually Funakoshi had enough students to open the first karate dojo in Japan. The dojo was called 'Shotokan' ('Kan' means 'building', 'Shoto' means 'pine waves', which was Funakoshi's pen name). In 1955, Funakoshi established the Japan Karate Association. Funakoshi served as chief instructor of the JKA until his death in 1957. Since then, Shotokan students have continued his spirit and teachings. 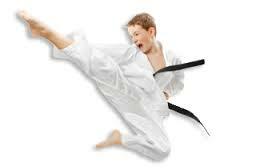 Enjoy Karate practice as a means for developing a healthy body and mind.